The doors of the second floor all have transoms above. they all are still working and even though I don't use them as much as I wish, I like that I can use them to balance out temperature in the house. The room where a transom would help the most is the bathroom (original bath). 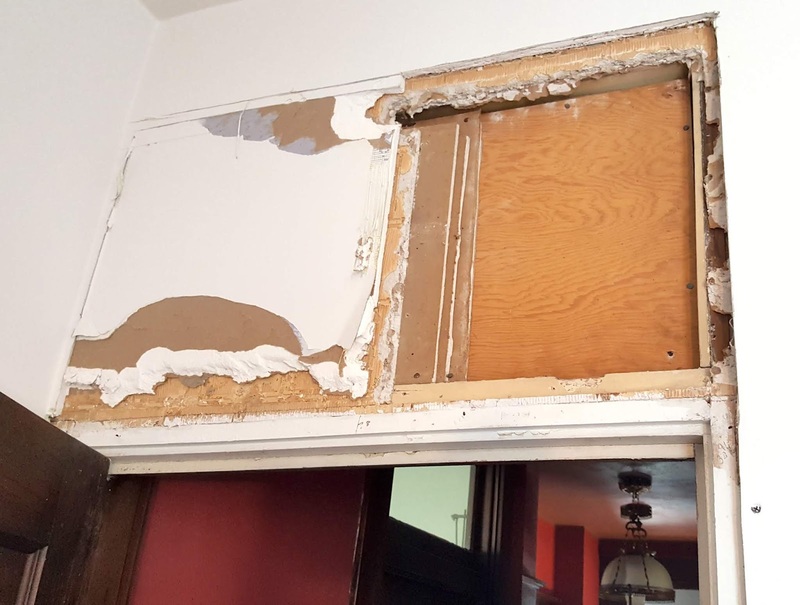 Sadly, in the late 40's the transom window was removed and covered over with gypsum board and tile (plastic tile). From outside the bath in the hall the transom was clearly blocked up. 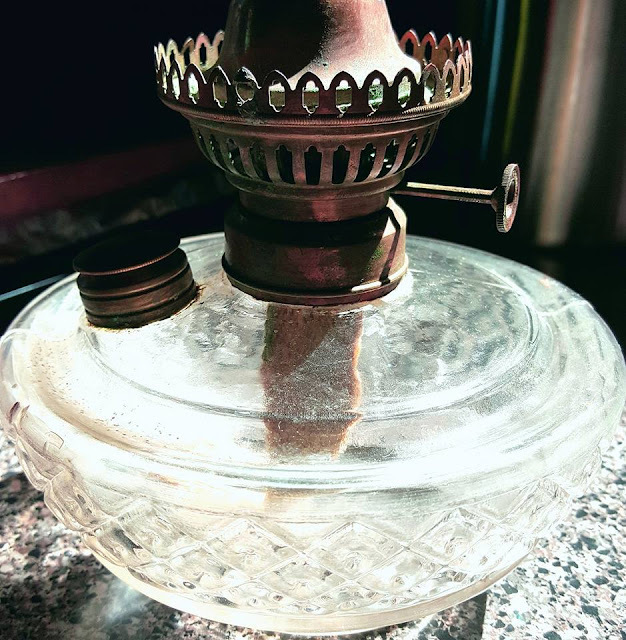 I have wanted to open it back since the day we looked at the house—even before buying it. With knife and pryer in hand, yesterday (finally) was that day. I knew there were a few layers of drywall and gypsum over top of the window frame and I didn't want to damage the walls, so I carefully cut the drywall with a knife to pry it out. Once some of the drywall was removed, I could see the gypsum and plastic tile adhesive layer. Again, I carefully cut through the adhesive and gypsum to keep the edges as smooth and damage free as possible. 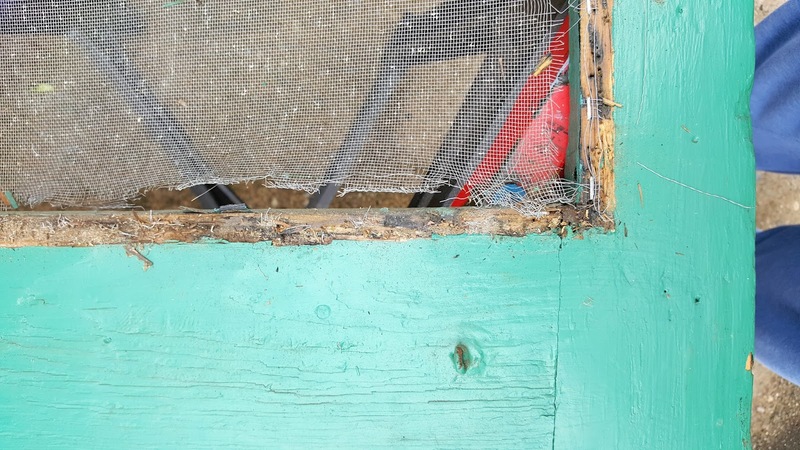 The work progressed slowly, but seeing the window frame in great condition was worth the careful journey. The first corner off - Yippee. So interesting that the folks who removed and threw out the original sash, unscrewed the hinges, then took the time and effort to put the old screws back into the wood. Half of the covering came off easily. The second half was glued in place and required a little more effort. It's interesting to me to see the original construction methods that are hidden behind the walls. Hopefully, rebuilding the trim will be straight-forward. From the Bathroom-side the plywood is clean of all the layers of overlay. From the hall way-side, finally some light can shine through and brighten up a rather dark space. We put the board back in (it is, after all, a bathroom—the one room you want some privacy in) as we wait to build a new movable sash. No, nothing was wrong with the carpet runner on the stairs. Sure it was old and dirty, but I could have cleaned it. Its worst offense—it was ugly. Right off the Home Depot rack. Uninspired. Ordinary (I do not have time to be ordinary). Not really in keeping with my aesthetic for the house. 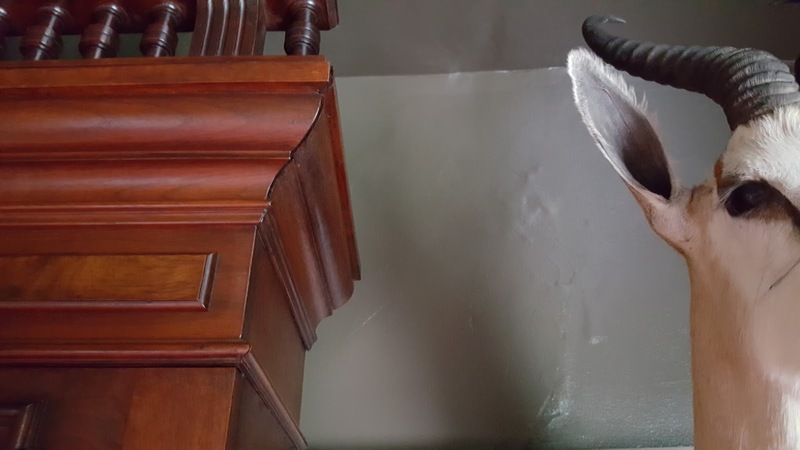 This is what the previous owners put on the stairs. Sure it's better than the wall-to-wall light beige carpet that was there (threads of that carpet were still clinging to the stairs under this one.) but it's so uninspired and ordinary. 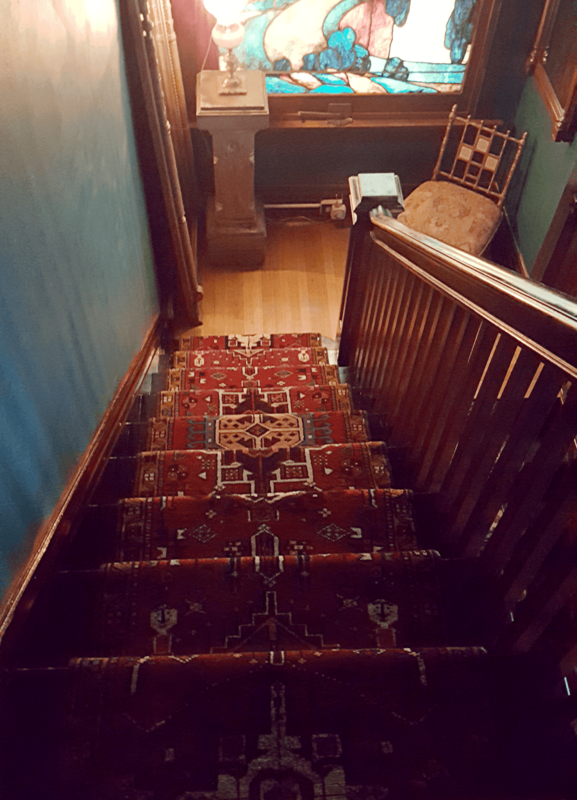 Armed with ebay and a few evenings time, I started looking for replacement runners for both flights of stairs (the shorter, wider flight from the main floor to a landing, then the longer, narrower flight continuing up to the second floor.) I was not about to buy something off a huge roll at a big box store. I carefully measured a tread and riser, did a little math, and figured the length of the runners needed. 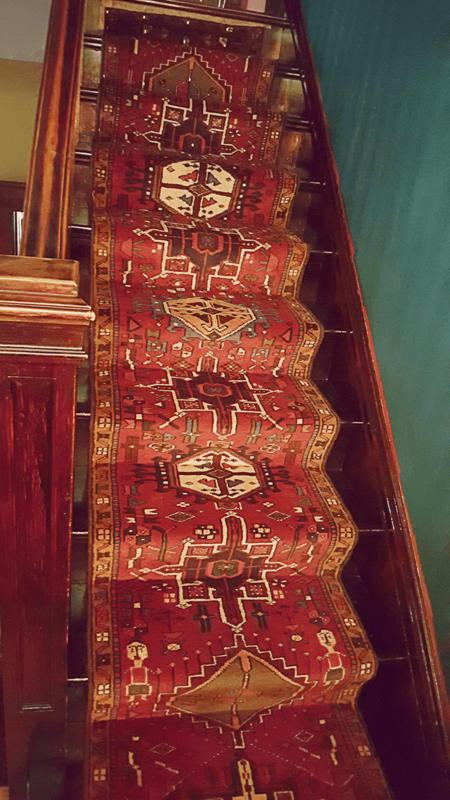 What I discovered online were myriad amazing, colorful, rich and affordable rugs—I felt like a sultan as I imagined myself wrapped in these gorgeous colors, patterns and textures. I dreamed of myself in Eugène Delacroix and Jean-Léon Gérôme paintings. I started looking for rugs for other rooms .... ok, back to the task. Finally, as with most of my fantastical dreams, reality dumped on me. I forgot to measure the width of the stairs. where in the hell was I going to find a 2 x 16 foot runner? This proved to be pretty disheartening since 100% of the rugs I loved were a few inches too wide. I became a little obsessive, but determined. 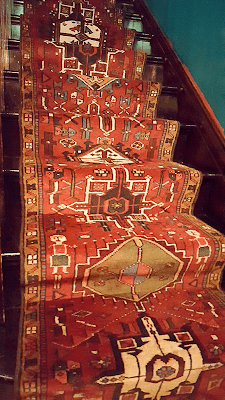 A few long rugs started showing up that suited the super-narrow width of the second flight of stairs—a rug for that flight proved to be the more difficult task. As runners get longer, they tend to get wider, too, but more beautiful. Wider rugs offered more visual space for complex patterns and color relationships. Finally, I found 2 rugs that would fit and were reasonably related to one another visually. One is antique, the other new. Both are woven in north west Iran (the BEST, most beautiful rugs are from Iran ...). The antique Heriz I chose will go on the lower flight. The new Karajeh is installed on the upper flight. 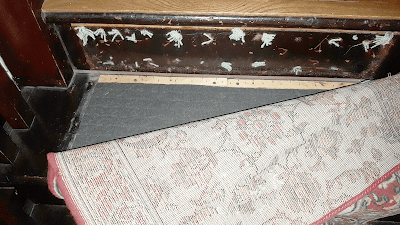 We saved the old rug because both of these runners are so beautiful that if ever we move, we're putting them back on—these 2 runners are coming with us. During my online search I discovered many informational websites helping me better understand the rugs of Iran's patterns, colors, textures and traditions. I am severely novice and hope to continue learning more about this fascinating art. 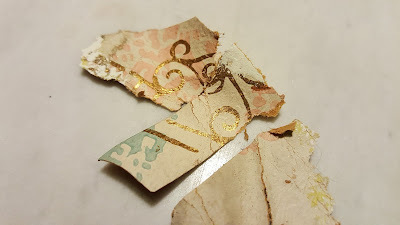 Tearing off the old runner took all of 5 minutes. Picking out all of the remaining staples took 2 hours. The tread padding was in good condition and the tack strips were good, so I kept those to reuse for the new runner. The stairs were filthy. I vacuumed, washed and finally recoated them with shellac. 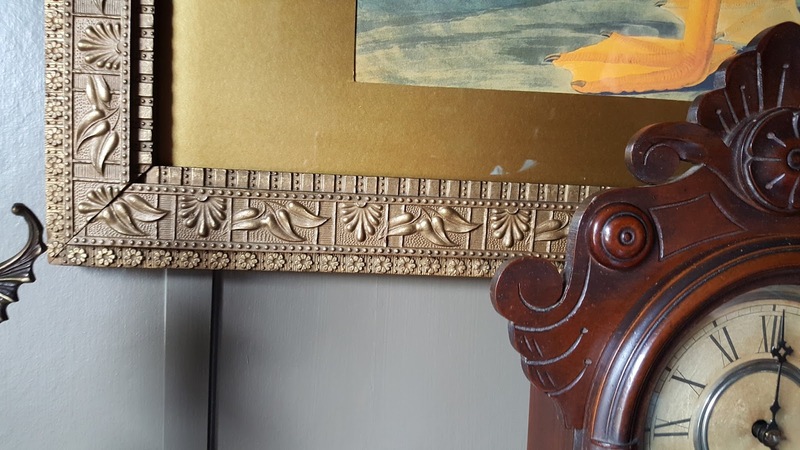 The red scratchy looking paint above the baseboard will be covered with Lincrusta and finished to look like carved wood, so no worries there. 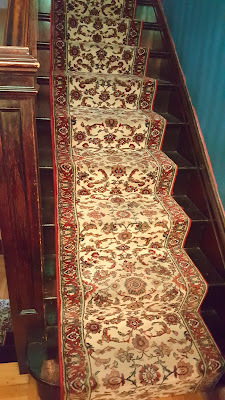 After removing the old rug and cleaning the stairs, existing rug pads and tack strips (both in good shape so I reused them), I quickly recoated stairs and baseboard with shellac. Best time to do that kind of stuff is when nothing is in the way—start fresh and clean. Ya know? Next came getting the runner positioned. It is about 12 inches longer than needed. Following both Nineteenth Century and current recommendations, I folded under the excess at the end in the event I need to reposition the rug later—exposing fresh pile. 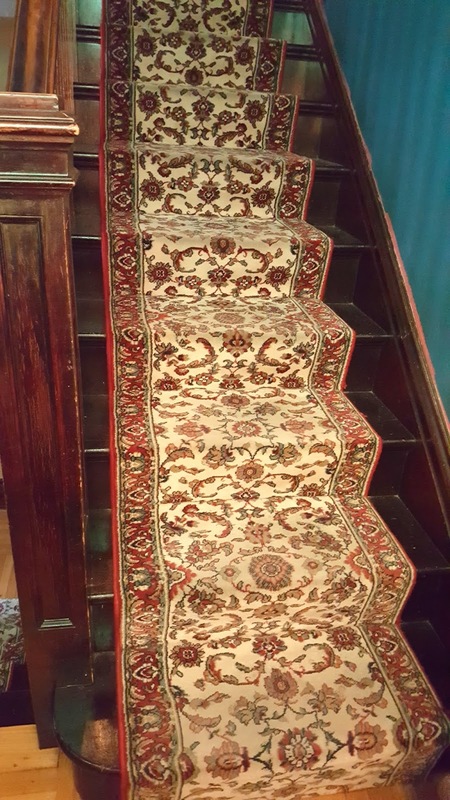 I loosely placed the rug on the stairs, adjusted it so the edges were reasonably straight along the wall and spindles, and began fitting it into the angles and smoothing it out by hand. Finally, once I had it in place and looking pretty good (adjusting the rug up and down to get some of the medallions placed strategically, I began pushing it onto the tack strips. 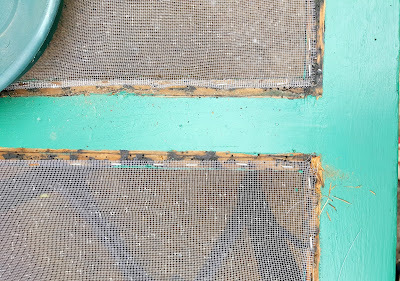 I added a few staples to each stair—mostly in the intersection of the tread and riser to hold it in place. A quick vacuum and voila - new gorgeous stairs. Closer photo showing the patterns and colors. My stairs are pretty dark, even in the daytime, so this image is a little under lit. Photo from the top down so you can see how intriguing the pattern appears as it falls together across the up and down of the stairs. Am I Beginning To See Chandelier Doubles ? 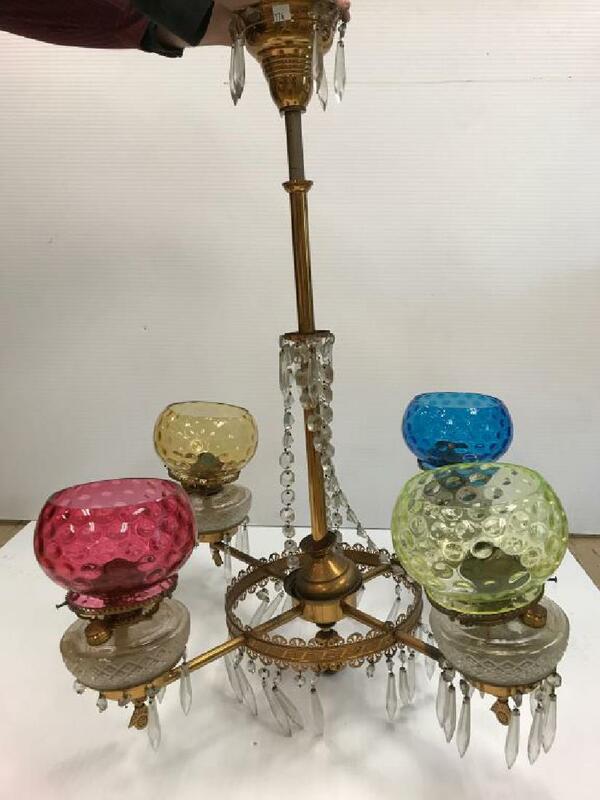 Not long ago, I was super fortunate to not only find, but win a pair of 1880s kerosene chandeliers in an online auction. Best of all, they were at an auction house that was within driving distance from my house. 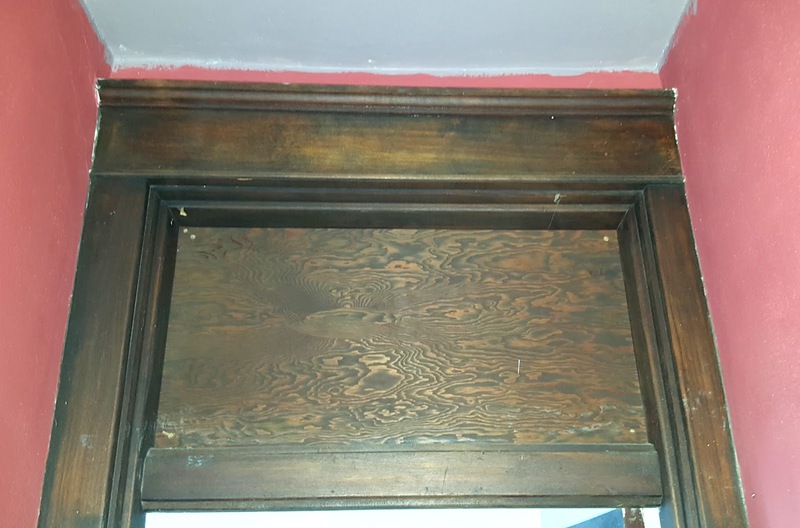 Untouched since they were hung in the 1880s, the glass is in perfect condition, save two chimneys that need to be replaced. Fonts, shades, burners, all working and undamaged. It was pretty exciting for me since I have wanted a pair like this for a while. Photo from the auction site of one of the pair of matching lights. Hung on large hooks in the ceiling, the lights have a pulley system that permits the person refilling the fonts with kerosene, cleaning the chimneys, or trimming wicks, to lower them so they can be reached from the floor. The pulley system is pretty cool, and it still worked when I got the lights. A "button" on the bottom of the light allows the user to raise or lower the light. Pretty remarkable after 140 years. So Now What Do I Do With Them? 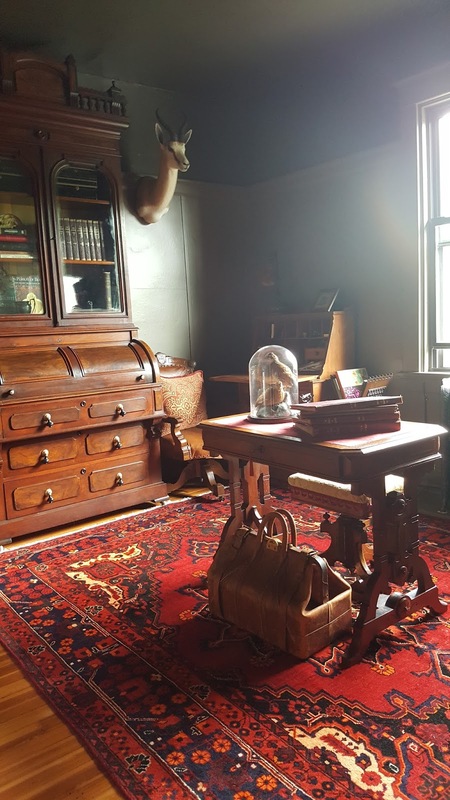 As the owner of some pretty fantastical things, I often contend with the question: how do I incorporate these into my everyday living conditions? For lights, of course, electricity is far easier and safer than burning kerosene. And I can flip a wall switch with electricity to see into the room, rather than walking in, lowering the chandelier, lighting each burner, raising it, then worrying about soot, fire, damage, etc. But ... 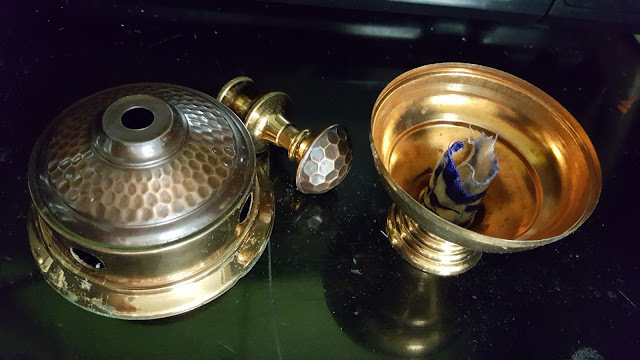 Here are untouched period lighting pieces—who am I to damage them to make them serviceable, today? I have been carefully researching the best way to electrify them since we picked them up in a rented SUV. 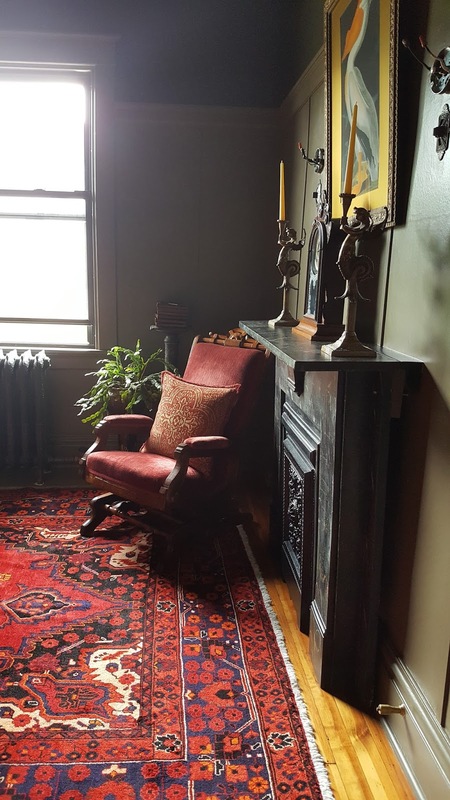 I talked with a professional chandelier dealer who restores the lights herself. She had cleaned and electrified a few in a similar style, about which she shared her expertise. After much soul and internet searching, I concluded that the best and safest way is the following. This will leave the in nearly untouched condition and they quickly can be put back into kerosene use at any time. How Lucky Does this Invention Make Me? 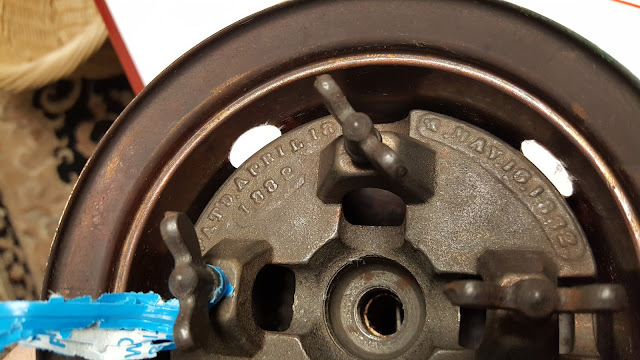 Thankfully, a small patented interior hunk-o-hardware makes restoring these so much easier. Each arm of most chandeliers is permanently fixed to the body of the light by solder or screws (that typically rust and corrode over time and tend to be nearly impossible to remove.) 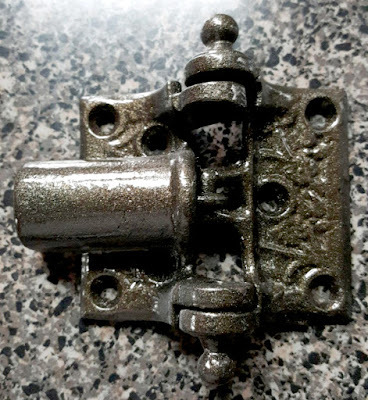 In spring of 1882, a small invention was patented to hold chandelier arm in place. 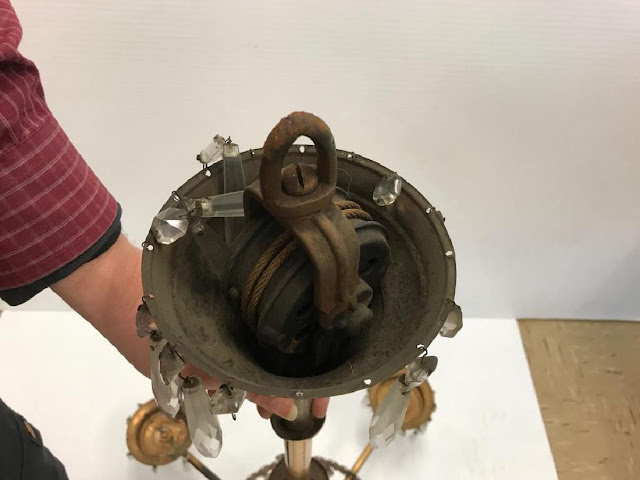 This little device is used in these lights and hides within the central body of the light to hold each arm of the chandelier in place with a tiny thumbscrew. The device as well as the end of each hollow arm is accessible by lifting a small "cap" (I think it's called a break) in the central cluster body. In fact, each thumbscrew is labeled with a tiny, numbered tag. How fantastic was the person who did that? Close up view of the patented chandelier arm device. the blue stuff is "twisties"to mark which arms belong where. 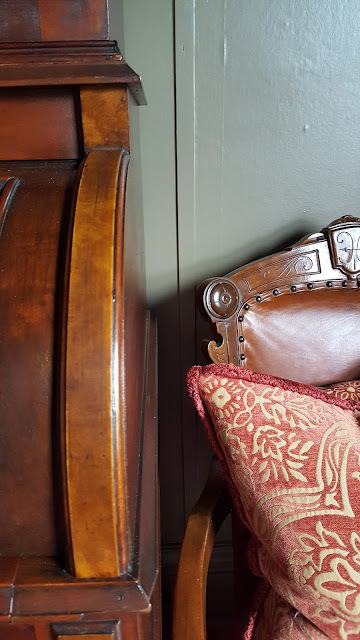 With this device in place, coupled with the hollowness of the arms of the chandelier, I have a pretty direct approach to adding electrical wiring through the arms and into the body of the piece. Within that space, I will be able to connect the wires from all four arms into a single wire that will go up to the electrical box in the ceiling from where the chandelier is hung. 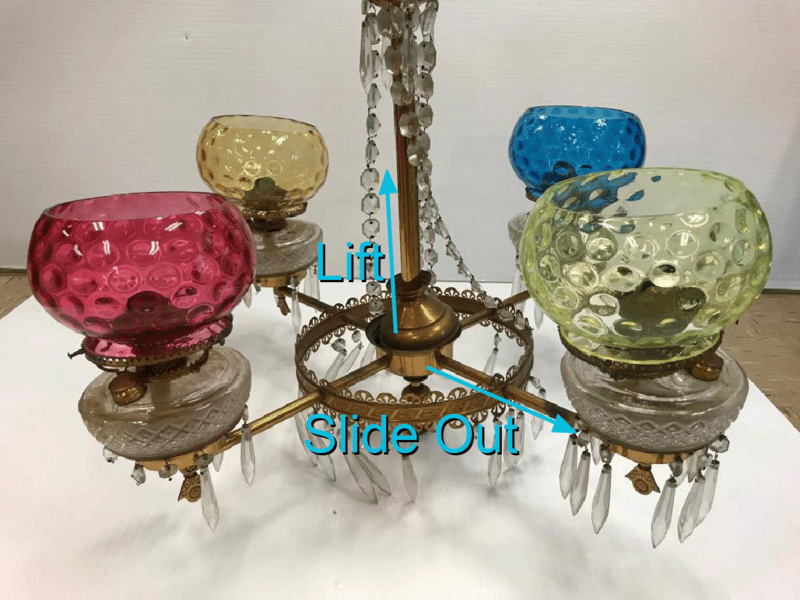 As noted in blue, the cap of the central body easily lifts (its a bit wonky in the photo) to expose tiny thumb screws that permit each of the four arms to slide out of the chandelier. Adding new screw-in electrified kerosene lamp burners to each font then wrapping the electric wire around the font and down to the chandelier arm, I can run the wire through the arm into the cluster body. I do, however, need to do a little damage. It makes me sad that I will need to drill a tiny hole in each arm to permit the wire to drop into it. 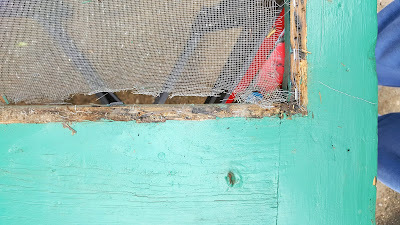 With care and a good bit of disassembly, I can position the hole so if returned to kerosene use, it will not be seen. 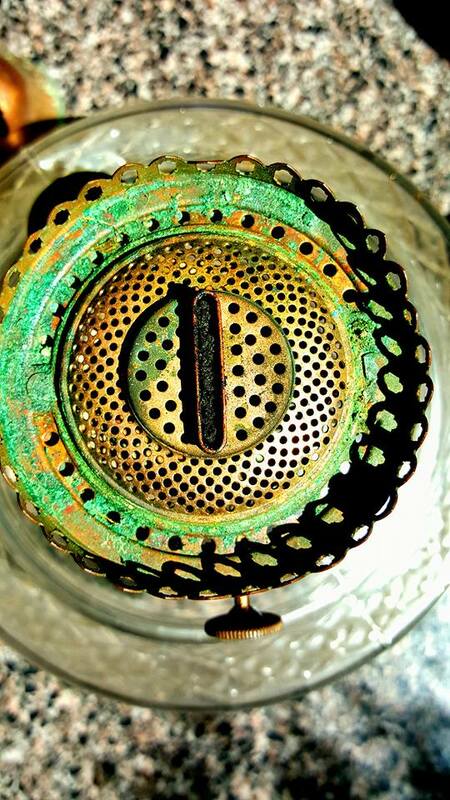 The hole does not interfere with nor change the use of the chandeliers for burning kerosene. Parts of the first disassembled chandelier washed, but not cleaned. 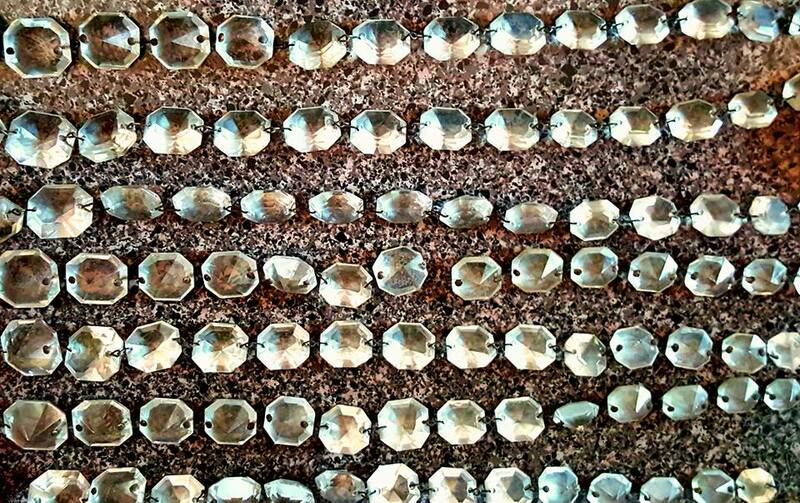 There are more than 250 crystal prisms and I washed and dried each one. All will be inspected to see if the tiny wire connectors need replacing. 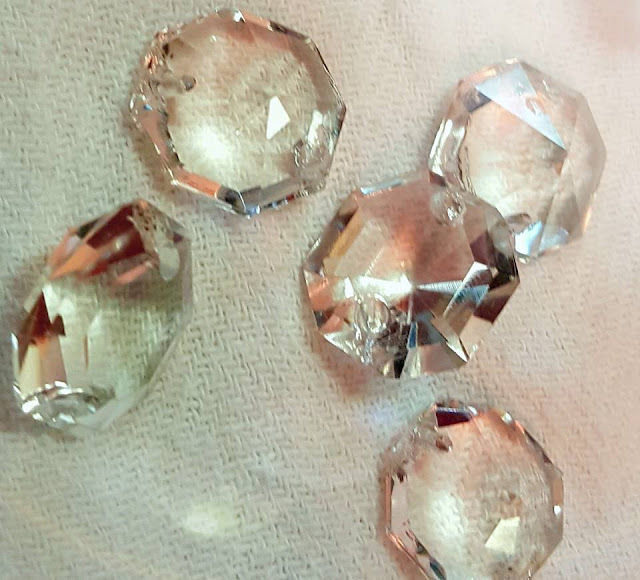 The chains of crystals are in good condition with a few small repairs needed. The shades are made in a pattern generally termed hobnail, or coin dot. The shape of each shade is commonly called a fishbowl (the shape I find most appealing) and is fairly uncommon. The four glass shades on the lights are each a different color and both chandeliers have the same set of four mixed color shades. 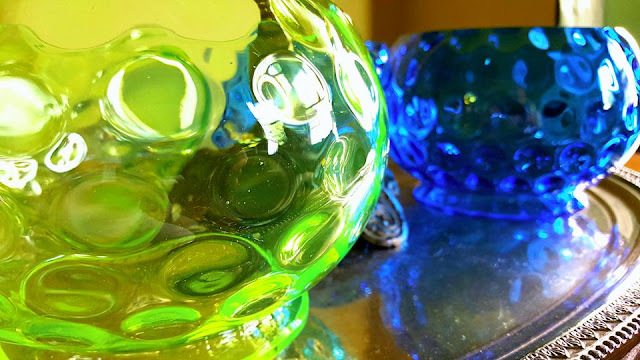 The colors are typical nineteenth century colors: cobalt blue, ruby red (which gets its color from the addition of pure gold to the glass), amber gold, and acid green, also called Vaseline or Uranium glass because it contains radioactive Uranium. It glows incredibly bright green under black light. Shades in Acid Green and Cobalt blue shine in the afternoon sun after a quick wash. The fonts were crusty with old kerosene. It cleaned out pretty easily with some Dawn dishwashing liquid and a stiff bottle brush. The chimneys are very fragile and of an unusual shape. Original to the chandeliers, there are 2 that need to be replaced. They are small and squat and as far as I can see, not reproduced. Guess I'll be haunting eBay and online auction sites for a while. Thankfully, I can hang and use the chandeliers without the replacement chimneys. To complete reassembly of the lights I need to get some threaded lamp pipe to connect all of the parts. The original pulleys and central poles will be archived in the event they ever are needed. The fonts sit within shallow brass cups at the end of each arm. In my rebuild, I am looking at using museum putty, a very sticky clay-like substance, or some kind of archival glue to hold the fonts in the cups so they don't accidentally fall out. A fall would put extraordinary stress on the electrical set up of the lights and possibly short out the system. I don't need a fire hazard like that. Stay tuned for the final assembly and hanging. I cant wait to flip that wall switch and see these light up. 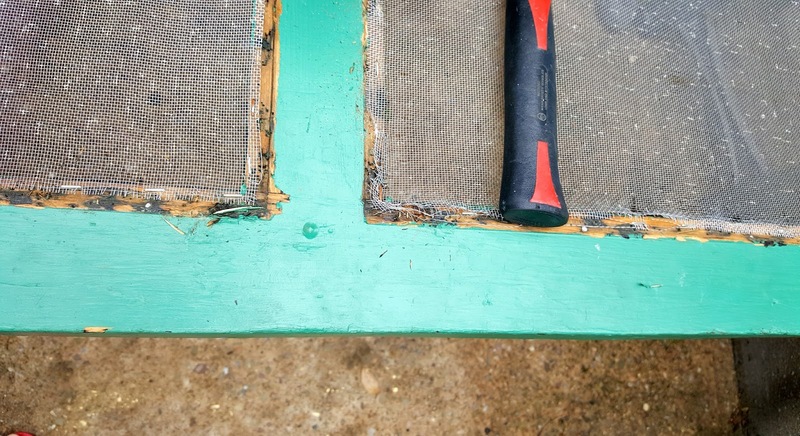 Can you even imaging an old historic home with a screen door "that" color? Like most homes, we have a "back door" that opens into the kitchen. Unlike many, though, we have a screen door, too, that makes airing out the kitchen after a peach jam cooking marathon a bit easier. 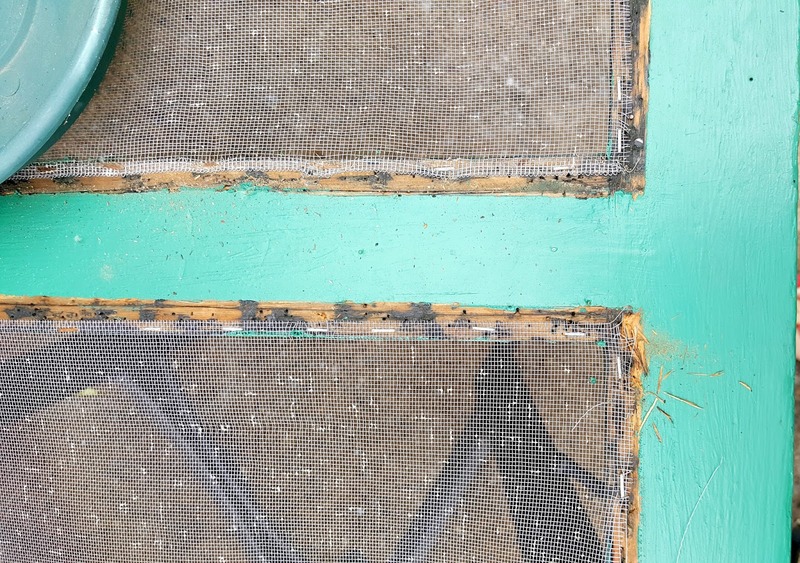 The screen door was painted bright teal in the late 90s when the rest of the exterior of the house was painted. It was hideous. 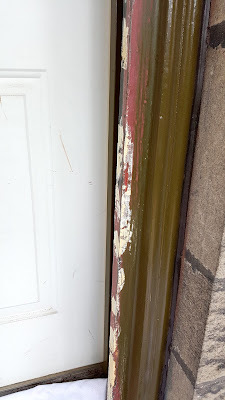 We painted the exterior 2 years ago and I did not have a minute to remove, repair and paint the screen door. 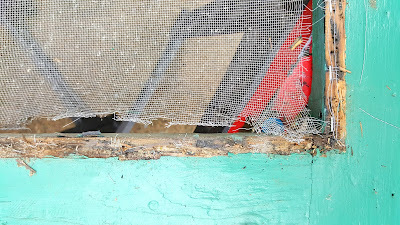 So last weekend, with a plan and a bunch of hardware, I took down the screen door and set out for a 2-day clean-and-install for the screen door. That was a great plan, but it took a full 9 days to make happen. 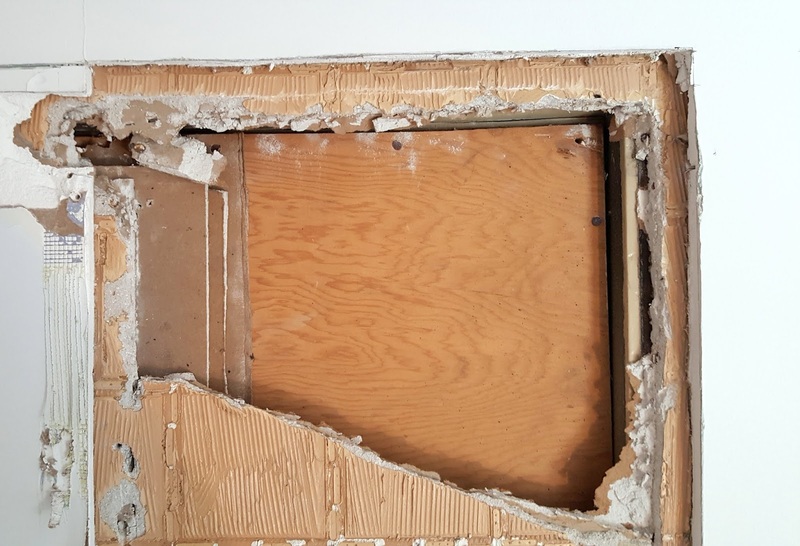 Popping out the hinge pins easily removed the door from the jamb—there were only 2 out of 3 remaining, anyway. The first task was removing the hinge hardware (I had removed all other screws, springs and handles during the week before so I didn't have to do that on the weekend). Of course the screws had thick globs of paint in the slots to ensure a high-level of difficulty and a greater chance of stabbing myself with the screwdriver or mat knife as I scraped clean the slots to turn out the screws. Removing trim wood and screen wasn't too tough. The slim trim used to cover the staples holding the screen in place popped right off and the mutilated screen came out pretty simply. 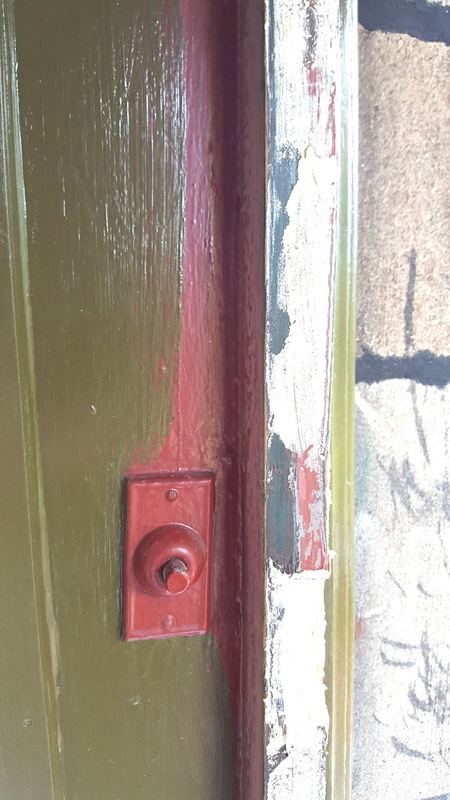 Once that was done I turned to scraping the door of some/most of the paint. Old latex and a super sunny day made for a sticky gummy job scraping and sanding. 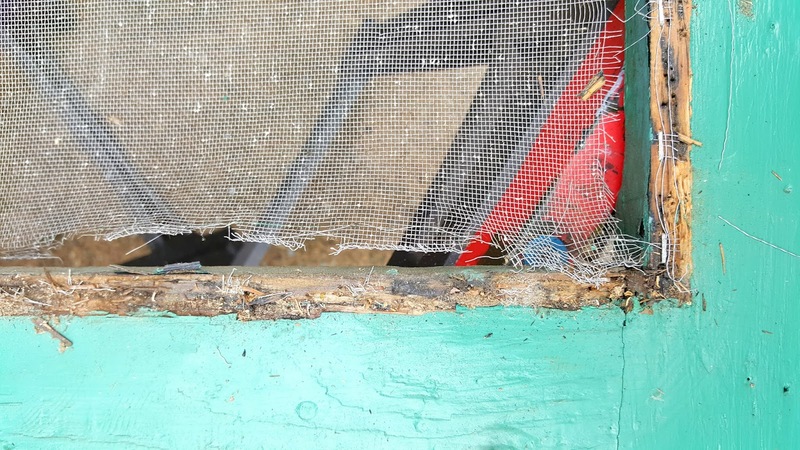 Once the screen door was out of the opening, the damage under the screen trim could be seen. The screen was barely held in place by staples, so removing them was fairly easy. 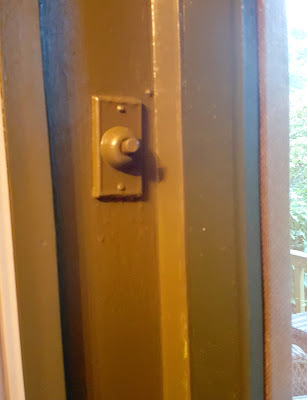 The back door has always had a doorbell. Red paint was used in combination with that bright teal (ugh). 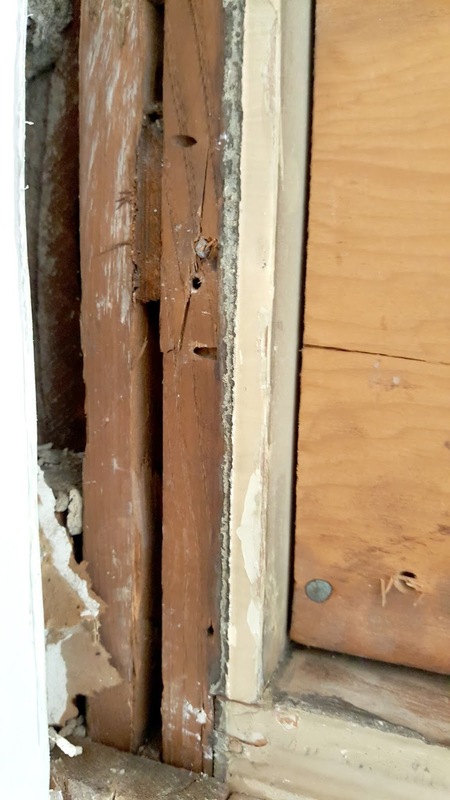 This strip of wood was added at some point to the door jamb. 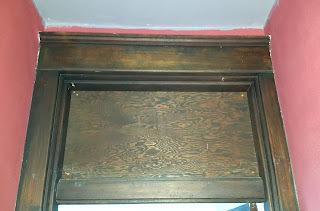 I doubt it is original to the house, but makes for a great place for attaching hinges. 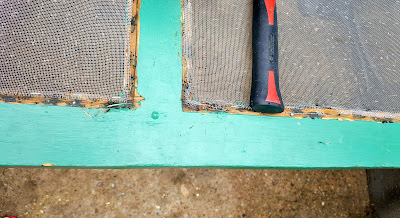 Next came patching all the holes and repairing the tack area for the screen as well as I could. 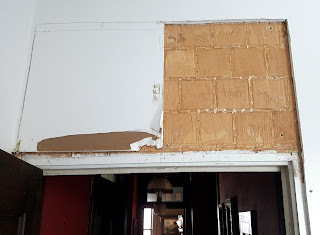 It had been shredded a bit from the last few times the door was re-screened, and needed a little reinforcement. White glue can do in a pinch, but I use Water Putty for most of these small repairs, now. You can mix only what you need, to the consistency you need. It's a fairly good consolidate on not badly damaged wood like this, especially if a little white glue is thrown in, and its pretty tough once primed and painted. Time to let that cure. 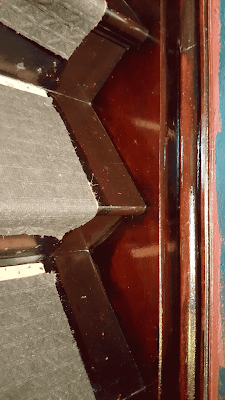 One odd thing I noticed while scraping and sanding and patching was that the chamfers on the upper part of the door stiles didn't end in the "lamb's tongue" as they should—they stopped dead at the top rail. After thinking on this for a while, I realized that the door had been reduced in height at some point—most likely when the glass transom above the door was removed and the kitchen exhaust fan added in the 40's. 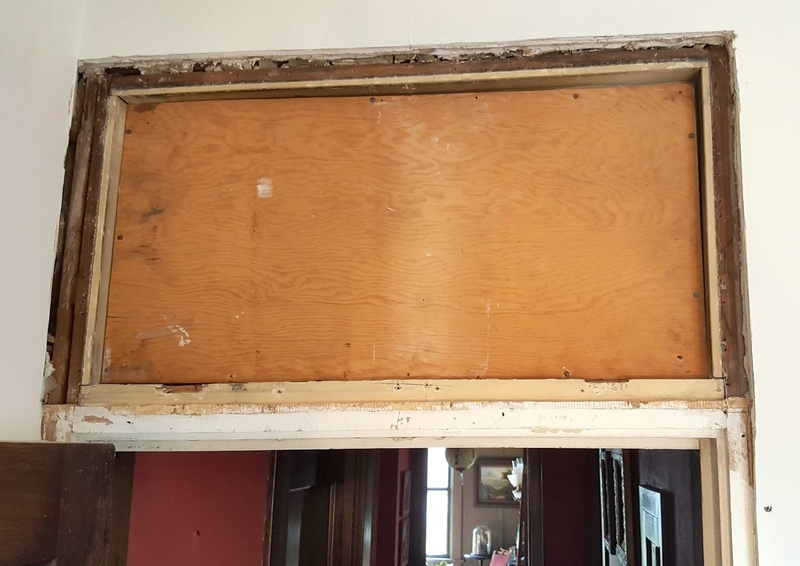 They built out a box to support the fan motor and in doing so reduced the height of the door jamb by about 18 inches. That required reducing the height of the screen door, too. No time to rest. Attention next turned to the door jamb. The other half of the old hinges needed removing and the holes and mortises needed to be patched. 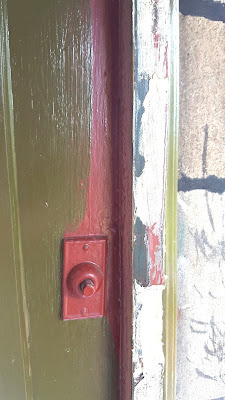 Globs of bright red paint covered the screw heads. A few other patches were needed since PO had nailed something all over the hinge side. At least they removed the nails. People are weird. Patches made, I ran down to check on how the patches on the door were coming. Since they were mostly dry I sanded what I could, left the rest to cure, and started on the hardware. 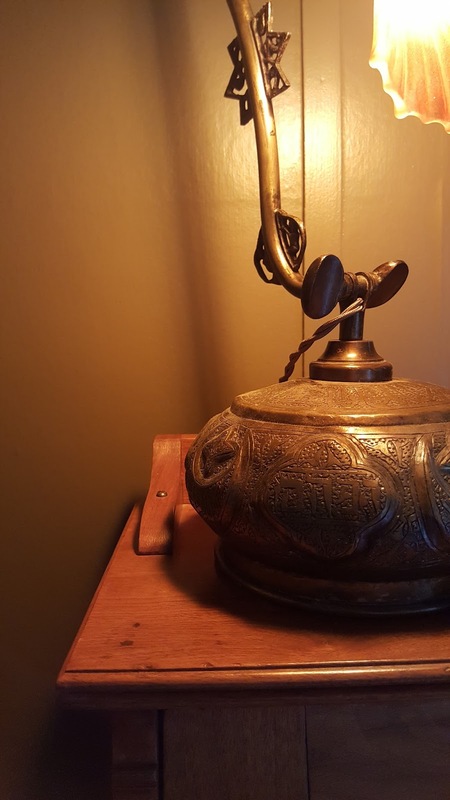 The hardware was a collection of pieces from eBay, antique shows and junk shops that I was determined should all match. All Eastlake in design, it was all purchased in bits, rather than sets, so collecting matching items was a little time consuming. 12 corner braces, 2 matching handles, 2 matching surface mounted hinges, a couple of bolts and hooks to secure the door. Most of it needed to have the paint removed, some of it needed to have the worn brass coating removed. All of it needed a good spin on the wire brush ride to add some shine and to "gussy-it-up." 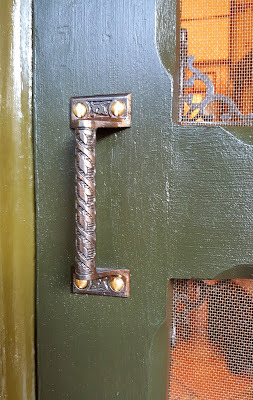 The hardware was all cast iron except for the screws and eye hooks, which are brass. I like the way the iron and brass look together—it feels tougher, more masculine. And in true restorer's form, I use only slotted screws when I replace things like this. After I got back from running I was really dog-tired. I had worked on this for 6-hours-straight and still was behind my planned schedule. I needed to at least finish the sanding, get some primer on both the door and jamb so it could dry overnight, and coat the hardware to waterproof it a little. Finished up the day with a run to Lowes to pick up screws, screening, and those slim little strips of wood that cover the edges of the screen where it's stapled to the door. I woke up early and trudged out to sand the primer I put on the door the night before, without even getting any coffee. I still planned to get the door up before the end of the day. A couple coats of paint went on well enough, flipping it and moving it out of the sun. The door is painted a color I designed for our last house's front porch floor, hence it's name: "Porch Floor Green." I wanted a dark yellow-based green that was nearly black without being black, and with no blue sheen or tint. Most paint companies make their green darker by adding blue, thereby making the green too blue to work well with the other colors I used. Its a great color that ages really well and fades (in the sun) to a dull yellowish-grey-green. 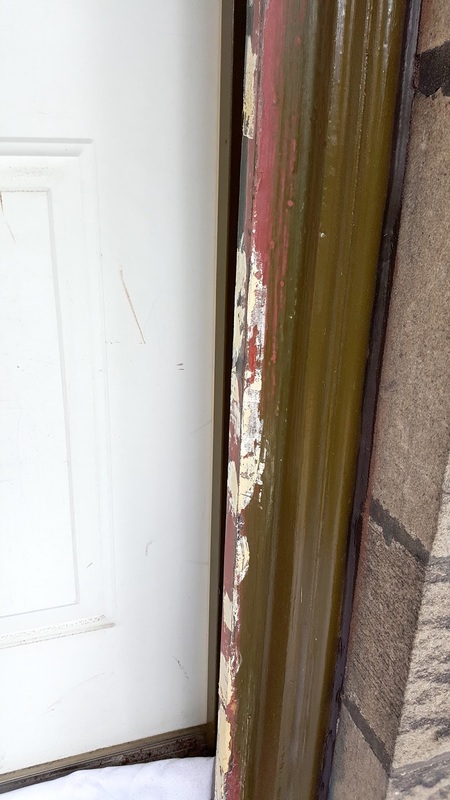 The door jamb got painted, too. Oh wait ... I still need to cut the strips to cover the screen-ends ... and paint them ... ugh. On the following Saturday morning I was able to cut and paint all of the little strips of wood for covering the staples. Attached them with brass screws along with the iron corner braces on Sunday morning, and attached the handles, too. Then, started the final stage of hanging the door. With a batch of shims in hand I slipped the door into the opening and started balancing the spaces around it with the shims. Of course it was out of square, but I got it to a place where it wouldn't bind and the hinges would attach well, so that was good with me. Just so you don't think I was taking it easy, this same second weekend of work I also bought, peeled and prepped a basket of peaches and made 11 quarts of peach jam. Why do I want so much? Attaching surface mount hinges is pretty simple, so of course I screwed it up. 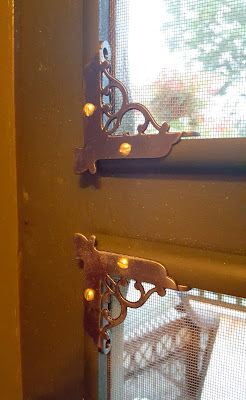 When I was about to screw in the first hinge at the top of the door, one of my antique cast iron hinges slipped and dropped onto the stone step under the door, snapping off one of the arms that holds the pin in place. It was useless, since a repair would never render it as strong as it needs to be to hold up a door. 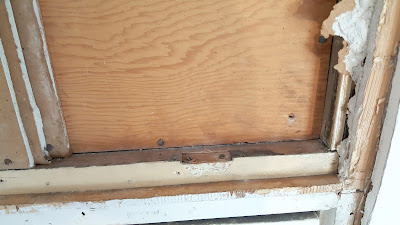 After a short cry and some foot stomping, I went to the box where I have old hardware on the third floor and dug out the hinges I was "saving" for the front screen door. This time I was more careful to avoid dropping and got them successfully attached. The one unbroken "back door" hinge. Im on the hunt for a pair of them to use on the front door (I'll need 3 since the door is so much heavier). 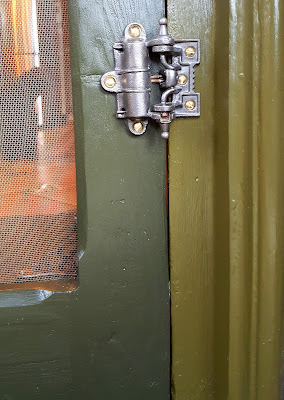 One of the "front door" hinges in place on the back door. 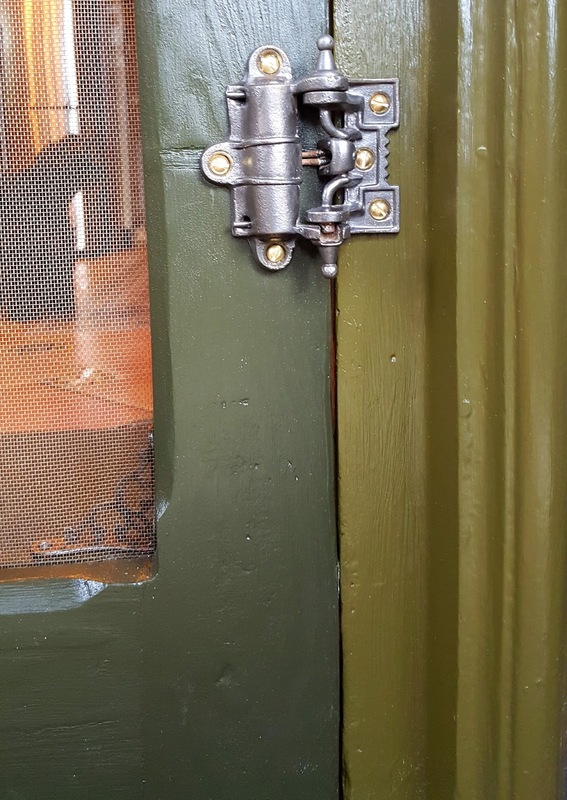 Love these hinges. Love those colors. It's all pretty yummy to me. 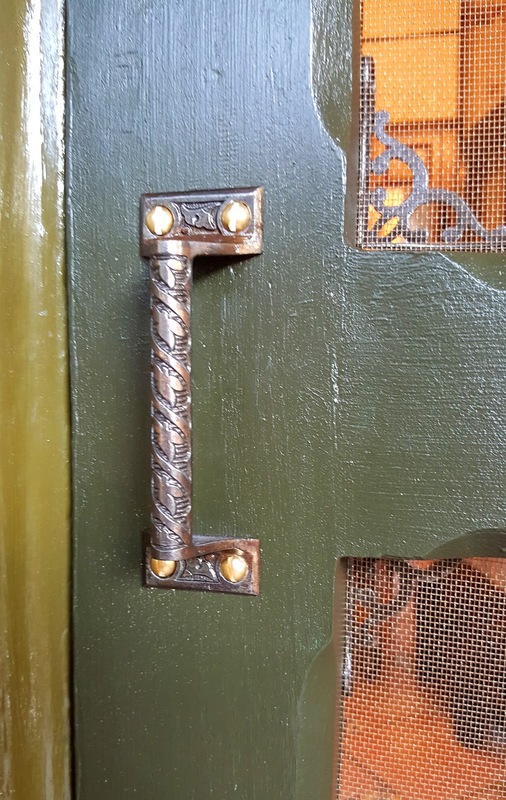 One of a pair of solid iron Eastlake-style handles. These are pretty tough to find. Most of the handle that aook like this are hollow in back, or are reproduction. Sometimes it pays to be eBay obsessive. 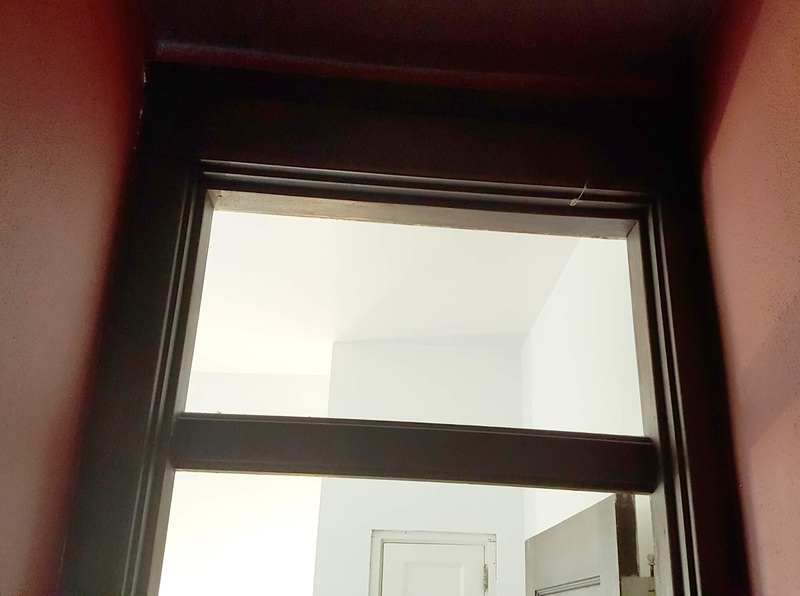 The final adjustments were to add the interior handle (you have to be sure to position it so the screen door and main door handles won't interfere with one another) and add a little hook and eye catch to use daytimes when we have the main door open. Screen door corner braces. 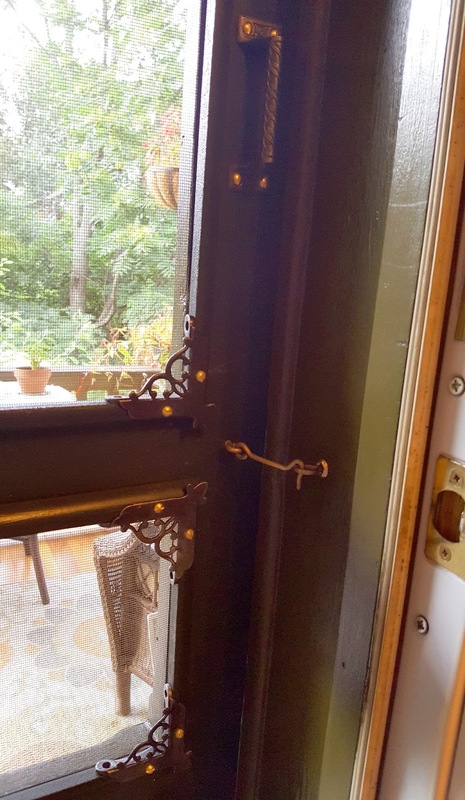 Originally intended to add support to flimsy screen doors, these are used here only for decorative purposes. Back door doorbell. Yeah - it's original to the house. Apparently, in 1905, the delivery person would bring packages to the back door for drop off, ringing the bell to let the servant know the package was here, or to collect payment. One day, I might restore the wiring to it. It doesn't work for now. All that metal ... so pretty. Finally some photos from the 2-year long transformation of our "new" library. 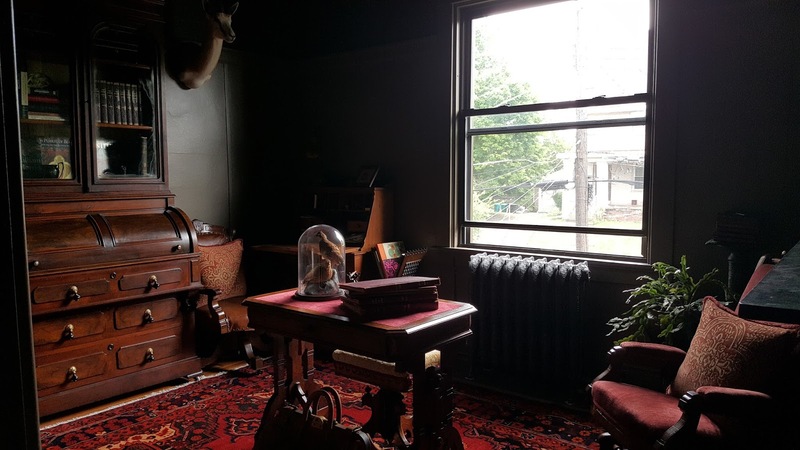 This room is the original nursery of the house: or so we believe. 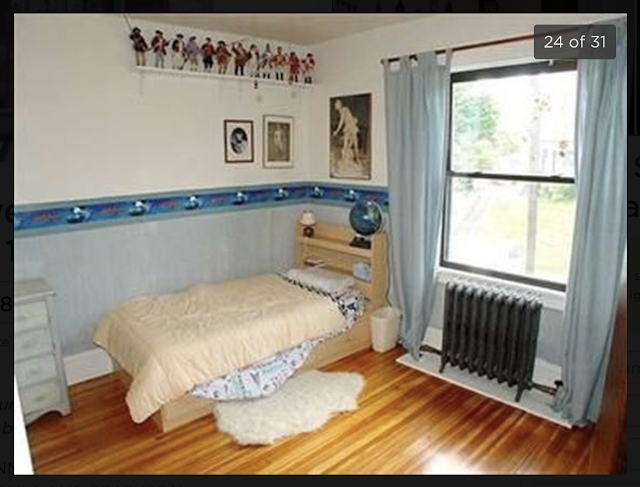 All decor (it has been redecorated more than any other room in the house) appear to be child-related. The most recent ones definitely were (including Sleeping Beauty, Cinderella, Harry Potter, and Star Wars themes.) And the original wallpaper was a pink and blue abstract design with a gilt pattern. That pink and blue pattern was not at all what I expected to find adhered to the bare plaster. The woodwork in the room has always been painted—there is no stain or clear finish on the wood under layers and layers of paint. This room had a lot of damage, too. 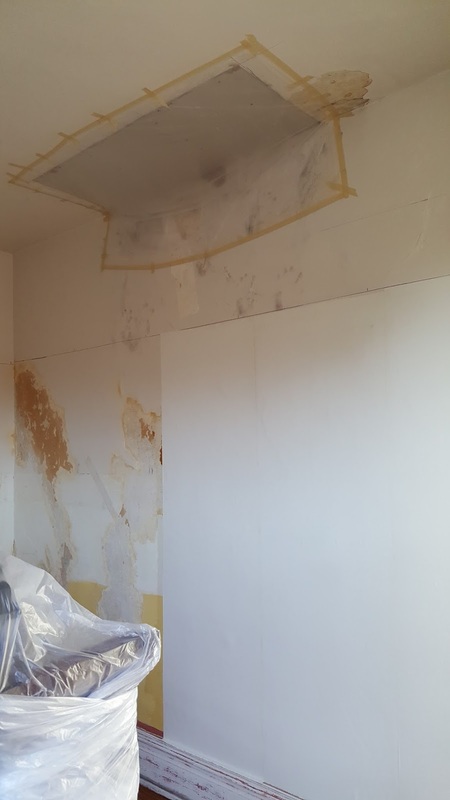 Water, plaster issues, floor damage and electrical issues add up to the reason it's taken us 2 years to (almost) complete it. There are some paint touch ups to do. And I need to find a long (looooong) paint brush to paint the wall behind the radiator. And a yet-to-be-done electrical repair. We also have some things to put into place, including photos and other framed art. 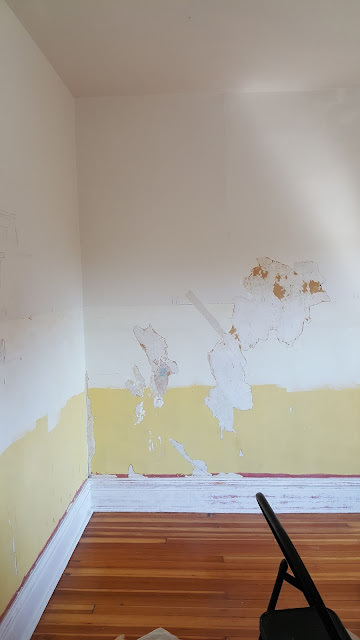 This is the room as it appeared when we purchased the house. That's a Harry Potter border running around the middle of the room. Scraping layers of wallpaper and repairing tons of damage to the walls was very time consuming. The big patch on the ceiling and wall where the chimney from the fireplace below leaked - for decades. There were about 35 small patches made over the years in this one area. More of a storage space during renovation. 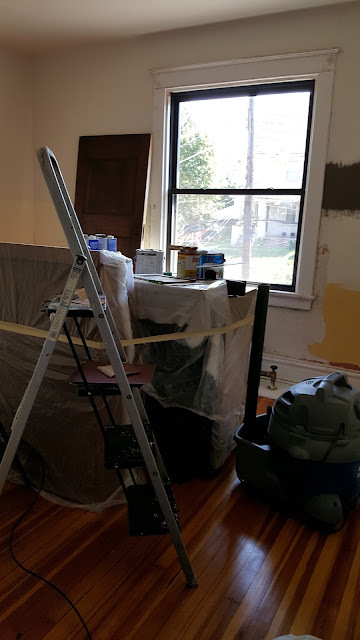 Adding "panelling" and patching more damaged plaster next to the window. 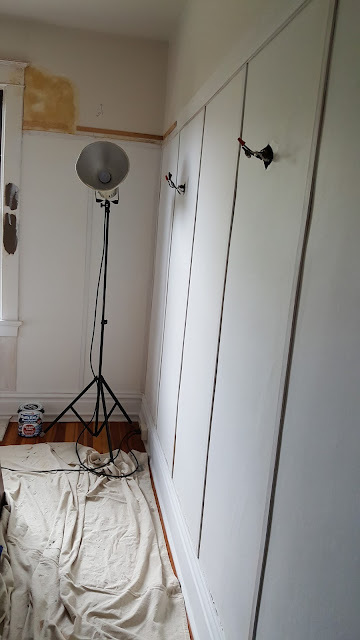 I use Water Putty (the tan spot on the wall) for a lot of my patching - it never shrinks and as long as you oil prime it, it can be used successfully outdoors. It's a pretty moody room. Dark, cool and perfect for reading, studying or getting real work done. Two desks—a drop-front and a cylinder desk—allow for easy and separate working. We love to add beautiful fireplace mantles where there aren't fireplaces (see the Parlor). I have yet to install the sconces, so for now the wires and electrical boxes are hanging out with the pelican. Worked all day to get the library ready for the upcoming house tour. Soon I'll post a full recap of what happened in there as we turned the 110 year old nursery into a sombre library. Here are some sneak peaks until then. Hope you enjoy. A cozy place to sit while you work. Look kids, a web-footed birdie. Keeping papers in order with an Eastlake-style paperweight. 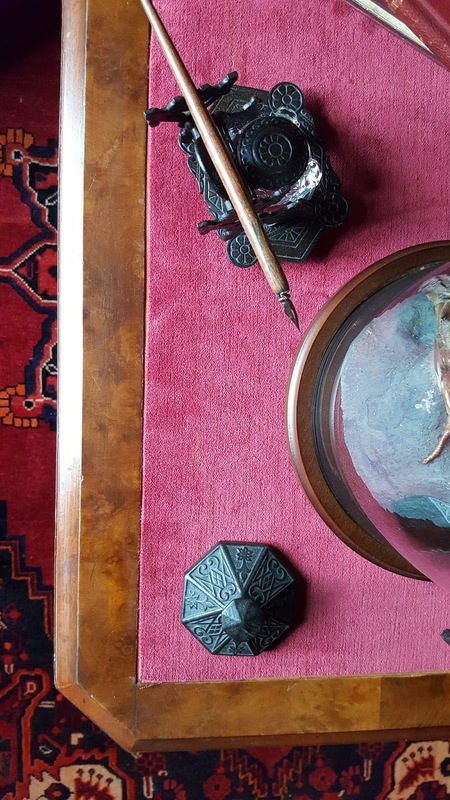 Lighting up the desk in a nineteenth century way.